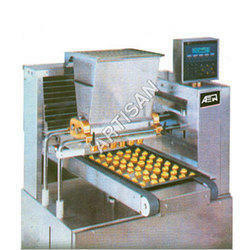 We offer Cookies Wirecut Machines Model -1 that helps in complete decoration of the cookies. The automatic spritz and wire cut cookie machines are meant for cookies in diverse sizes and shapes. Precisely engineered, these machines provide lasting performance and are wide used in the restaurants, hotels and food processing industries. - The machine performs on the principle of suction and portioning using cylinders. - It operates accurately with cylinders controlled by servo motor and PLC. - The machine is available in three phases or single phase power supply. - The weight of the cake can be varied between 10 to 500gms. - The machine is fitted with PLC computer and touch screen controller. The Suprema is designed to the most versatile and compact wire cutting and dropping machine for producing all range of cookies. All the parts that come into contact with the food can be completely dismatched for correct and fast cleaning. Capacity: 25x7x50 min/120 = 70 Kgs per hours.